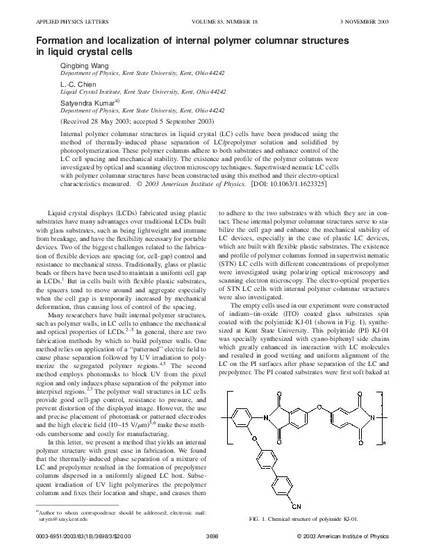 Internal polymer columnar structures in liquid crystal (LC) cells have been produced using the method of thermally-induced phase separation of LC/prepolymer solution and solidified by photopolymerization. These polymer columns adhere to both substrates and enhance control of the LC cell spacing and mechanical stability. The existence and profile of the polymer columns were investigated by optical and scanning electron microscopy techniques. Supertwisted nematic LC cells with polymer columnar structures have been constructed using this method and their electro-optical characteristics measured. Copyright 2003 American Institute of Physics. This article may be downloaded for personal use only. Any other use requires prior permission of the author and the American Institute of Physics. The following article appeared in Appl. Phys. Lett. 83, 3698 (2003) and may be found at http://dx.doi.org/10.1063/1.1623325.